The increasing push for brownfield development coupled with the sustainable necessity of naturally ventilated buildings leaves the problem of how to provide acoustic mitigation within multi-storey dwellings in the noisiest urban areas without having to close windows. The issue generally comes to the fore during project consultation stage with the Local Authority, who will commonly require that acoustic standards are achieved whist giving future residents flexibility over ventilation arrangements. The Building Performance Centre at Edinburgh Napier University were requested by Defra (Department for Environment, Food and Rural Affairs) to undertake research into this area to provide data that is otherwise missing in the general literature. 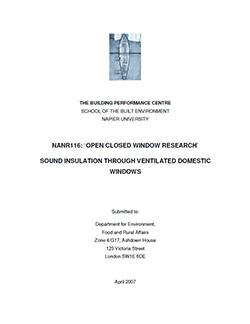 The project looked at the sound insulation of external facades and in particular insulation offered by various window arrangements, subjected to a variety of external noise sources. The project involved laboratory testing of over 300 different window arrangements. 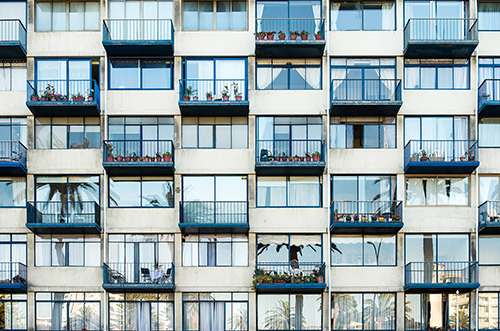 It culminated in the report to Defra which formed the basis of the advice on external facades sound insulation published within the new PPS24 guidance document.